Chloe Benjamin is the author of the New York Times bestseller The Immortalists and The Anatomy of Dreams, which won the Edna Ferber Fiction Book Award. She is a graduate of Vassar College and The University of Wisconsin-Madison MFA program. Learn more at ChloeBenjaminBooks.com. "A debut novel of subtlety, depth, intrigue and tenderness. Chloe Benjamin is a great new talent." "The way that Benjamin gives equal weight to both the romantic relationship and the novel's more cerebral, philosophical questions is impressive -- and a feat we hope to see in many more books to come." "Uncertainty lingers through much of Benjamin's book, which has all the trappings of a scary thriller, but which skillfully converts itself into something more genteel and, in a way, more methodical: a study of the grim work of growing up." 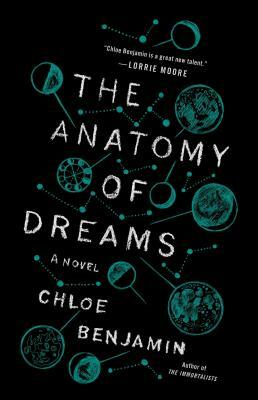 "After reading Chloe Krug Benjamin’s The Anatomy of Dreams, you’ll never dream the same way again. Benjamin’s debut is a majestic collision of sci-fi thriller and love story that explores, as the title claims, the anatomy of dreams — their power, both chilling and beautiful— through the lens of a young couple. Sylvie and Gabe meet as teens at a California boarding school and, years later, become sleep researchers investigating lucid dreaming under the instruction of their former teacher, an intelligent and mysterious man with potentially sinister intentions. Though anchored in reality, their story takes surreal turns.It’s a riveting tale that will instantly transfix readers, like a dream you’re not quite ready to wake up from." "A sly, promising, and ambitious debut." "Rich in metaphor and hypnotic rhythms, the prose is lyrical and dreamlike." "A beautiful, haunting plunge into a mysterious world where the real and the dream are cleverly blurred. Sylvie’s story drew me in from the first, and the subtle menace kept me turning pages to its surprising conclusion. Chloe Benjamin has crafted an eerie, compelling first novel which, like the lingering effects of a vivid dream, resonates long past its finish." “A vibrant, ambitious novel that wrestles with the big complexities of early adulthood—the impossibility of fully knowing a partner, the quixotic desire for meaningful work, and the surprisingly sudden nature of obsession. Chloe Benjamin’s impressive debut shimmers and surprises with its wonderfully original fusion of compelling quirk and surreal mystery." "This stirringcoming-of-age story explores the murky landscape of the human psyche and forcesreaders to question the fine line that defines our moral limits. A subtle yetstartling debut, The Anatomy of Dreams is both a psychological thriller as wellas a love story that will transfix readers all the way to its portentous conclusion." "In deft,tender-but-not-sentimental prose, Benjamin follows her protagonist SylviePatterson from a boarding school in northern California to the New Englandcoast to the Midwest along a journey influenced and shaped—in ways even Sylviedoesn’t understand—by an enigmatic headmaster and medical researcher, and by Sylvie’sfirst love. Benjamin’s novel envelops like a dream, but also provides a muchmore complete, satisfying story than a dream can." “This elegant first novel is both driving mystery and stirring love story…A fast-paced, satisfying read from a bright new talent."